This is the fourth and final interview in a series of interviews with Joan Gregory about Art Journaling. It’s been some time since the last post; thanks for hanging in there! Once you have a sense of the way you can explore your experience with journal work, are there ways you can shape the process to take yourself in a specific direction? Yes, there are ways to shape the process. For example, in 2005 I wanted to be in a place of gratitude. Looking back at my journal I could see that there was still a fair bit of whining going on, and I decided to only write about the things I was thankful for. It does have value to do that; it reframes how you look at your day. It’s not that you deny that the bad stuff is happening; it’s just that you are not choosing to write about it in that journal. One thing to do, whether you are journaling on a scrap of paper or in several books, recording dreams, poetry, or other writing, is always date your entry. A really interesting thing to do is cross-reference the entries after a bit of time has passed. It’s lets you see how all the different pieces are fitting together. Thinking about dating, makes me think it would be interesting to do that with quotes as well. I’ve collected quotes, but I haven’t noted when I found them. Time can become so fluid; something that happened twenty years ago can feel like it only happened five years ago. Some things like web pages or magazine articles have dates on them, but for anything else that you collect, that doesn’t have a date, yes date that too. I even like to write the date I’ve gotten a book in the book. As well, when I buy books, I’ll note the titles in my journal, another way to document what interests me at a particular stage of my life. Then later, as you go back through your journal(s) you can see, “oh, this is what I like, this is what resonates with me, what has meaning”. These are just more l clues along your path to determine who your true self may be. Are there books or articles about journaling that you feel have been helpful? One of the articles I’ve kept is called, “Leaving a Trace”; an excerpt from a book by Alexandra Johnson called Leaving a trace: On Keeping A Journal. It’s examines the answer to the question, “why am I keeping a journal?” This is an interesting question to ask yourself, and to explore in your journal. It will likely lead to other areas to delve into. Is it to leave something for my children and grandchildren? Is a place for me to reflect on my life and experience? Is it just for the pleasure of creating something personal? There are so many resources on journaling available in different formats. There are ‘how to ’books, memoirs and diaries of well-known writers, articles in various magazines and on the internet. It is really difficult to limit it to a few. However, in addition to those I have already mentioned in previous segments of this interview, I have found these to be inspiring. I have already referenced Ira Progoff’s Intensive Journal Workshop. The next best thing to attending a workshop would be to read the book, At a Journal Workshop: Writing to Access the Power of the Unconscious and Evoke Creative Ability. I have attended one of the courses and highly recommend the experience, especially if you seek guidance from, and connection to, your inner life. It definitely deepens and broadens your journal work. A favourite answer to the question, “Why do you journal” comes from this book: “To interact with your life”. There is an upcoming Journal Workshop in Edmonton in late July/early August. You can go to their website to read more about the process and to get further details on workshops in your area. I think we’ve all gone through periods where things can seem flat; where nothing seems to be catching your attention; times when you feel like there is nothing to write or say; times when It all seems dry. What can you do when you come to your journal and there is nothing to put on the page? Whether you are a poet, a writer or an artist, you have to first be an observer, a wonderer, and a collector; not so much a collector of things as a collector of impressions. Begin to bring a child-like curiosity to the way you explore. If you can meet your journal page everyday with that openness, with not knowing, as if you had never seen a day before, as if you had just arrived, you will bring presence and freshness to the page. To take it another direction, resurrect the lost art of pretending that we experienced as children. Allow yourself to become a fictional or historical character moving through your day. What would you see if you were say, Alice in Wonderland, or Anais Nin? Use your imagination to view your world from a different perspective and write about it. You could also imagine yourself twenty years from now. As you look back from the future, who do you see sitting there writing? What is her world like, what are her hopes and fears? This is another way of recognizing who you are in the world. Do you find that the Art Journal process opens the journal process up? Yes, it engages more of your senses and provides a way to use all the ephemera of your life. Throughout the day you encounter news stories, tickets, stamps, ads, magazine pictures and more, and if you are open to these they can find their way into your journal to document your day. So you end up seeing more, and finding more beauty in every day. Each day you encounter endless possibility for story. From the simplest thing, like seeing a fallen leaf on the ground in the fall, to seeing an older woman walking up the street using a walker, we are bombarded by story potential. If you are open to receiving, there’s no limit to what you can write about. If you feel a bit overwhelmed, pick the top three things that stood out for you that day, choose one and reflect on it. Why did that capture my interest today? What’s going on that I would recognize this one thing as significant? You can use these questions as a starting point. Have you ever used your journal to help you make a decision? I’ve sometimes done that by fully imagining where different decisions lead. I could have used that thirty years ago! Yes, you can use your imagination to gain access to guidance. Ira Progoff uses what he termed ‘twilight imagery’ (similar to Jungian active imagination) in the journal process as a vehicle to access a ‘deeper-than-conscious’ level of ourselves when at a crossroad where a decision has to be made. The technique is used to explore the possibilities of both the ‘roads taken and of the roads not taken’; to provide a self-generated inner knowing and affirmation, as well as the resolution and energy to carry that decision out. What gifts has the process of writing, rereading, and reflecting in your journal brought you? The surprises are, as you reread, the realization that you already knew something that you feel you are just now learning, or discovering something that you know you wrote that somehow makes you think you found it a book, it’s that profound. The biggest gift is learning about who you are and acknowledging how much wisdom you actually have. We all have these gems of knowledge buried within. The journal mirrors you to yourself enabling you to see aspects of yourself that you weren’t aware of, or that you didn’t give yourself credit for. You begin to trust yourself more. Some mornings I’ll take time to go back over the same date in the previous four or five journals to see what I wrote there. Often I will find very similar passages to those I am currently writing and think that I haven’t moved an inch in terms of personal growth, but this repetition is common in journaling. Published journals have similar entries edited out, but there is merit in what at first appears superfluous. He continues by saying, “Another astonishing way to look back is to pick up some diary entries or notes that you kept a long time ago. You’ll be astonished. Things that you were convinced you had realized more recently will be all pinned down there. These are driving themes in your life”. Is there a difference between the Joan on the page and Joan the person? When I communicate with other people I generally filter what I say to accommodate how I feel the other person will receive it. I think most of us do some form of this. In my journal I am as authentic as I can be. It is a place to be real and true to oneself. If you aren’t going to be honest you won’t receive the mirror’s gift back, or what you do receive will be distorted. You might go back and come to sections that have not been written in your voice, and then begin to explore whose voice it is. Journal work is a way of removing the layers that have accumulated and gradually exposing one’s true self. It can be a way of getting off the same old track, going deeper than those circular ways of thinking that lead us back to the same spot without more insight. You have to stop and be reflective. Journal writing takes you along that boundary between the inside and the outside of your life; a very creative place. It allows you to play and to develop some gentleness with yourself. 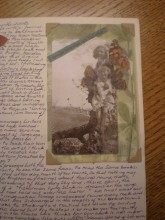 Art journaling also offers some softness to the process and the materials provide another dimension. Where can someone go to learn about art journal making and to meet others who share art journal interests? I have mixed feelings about that, based on my own experience. When I started journaling it was all self-discovery; I am self-taught. So, I don’t think you need to go out and buy a book on it, and I didn’t do that until I was some years into it, and wanted to branch out a bit. As with journaling, resources for art journaling are abundant, dare I say, excessive. Only if you truly believe you don’t have a creative bone in your body would I recommend a book. It’s great to start on your own because you will get a sense of your own style. The book I would recommend is The Decorated Page by Gwen Diehn because it is so full of doable ideas. It’s a great book to use by following her instructions to a T, or to simply take one or two techniques to try. This book is now only available used, but a newer book, also by her, is The Decorated Journal: Creating Beautifully Expressive Journal Pages is available in paperback and hard cover. Stampington & Company offers many publications for artists and crafters. Art Journaling is one publication that will interest journal makers. Another one of their publications, Somerset Press – The Art of Paper and Mixed Media, also contains articles and tips for journaling. Also, if you’re looking to pursue art journaling in a group setting, Teesha Moore, founder of the annual Artfest held in Port Townsend Washington, created Journalfest last October. Her website has information about events. What actually happens is the more you do the better you get. The more you do, the more playful you become and the less seriously you’ll take any one piece of work. You discover happy accidents and a sense of fun. Getting yourself going and doing is the main thing. The work shows the way. As you are writing and collecting and cutting and pasting and fooling around with lettering, something else enters your mind, you make a connection, “oh, I could put that with that”, that you wouldn’t have made just by thinking about it. That way you develop from your work and you gain confidence in your own abilities and intuitions without reference to someone else. Referring to someone else’s work is like having training wheels on a bike; you have to take them off in order to know you can ride. You can’t compare your first work with those who have been art journaling for awhile already. Remember that you are making comparisons to their published work. They went through the learning curve just as you may be doing now, only you don’t see their first attempts, just the end result. You have to be willing to be a beginner. As this is our final session do you have any parting words? One of the most intriguing visual depictions of a journal is in the film, The English Patient, based on the novel by Michael Ondaatje. It is used as a thread tying together much of the story. The journal is actually a copy of Histories by Herodotus, regarded as the father of history and credited as the first to see many different stories as part of a single whole story. Almasy, the lead character and owner of the book is never without it. His journal entries are written in the margins and empty pages and it is layered with sketches, maps and photographs he has pasted into it. He calls it his ‘commonplace’ book but values it as a prize possession and his ‘historie’ is his companion throughout his life. That pretty much sums up the essence of a great journal.